You are here: Home » GENRE » Cri-Fi » Hobbs & Shaw (action movie trailer). Hobbs & Shaw (action movie trailer). The Fast & Furious franchise gets its first spin-off as Dwayne Johnson and Jason Statham reprise their F&F roles as Luke Hobbs and Deckard Shaw in Hobbs & Shaw. 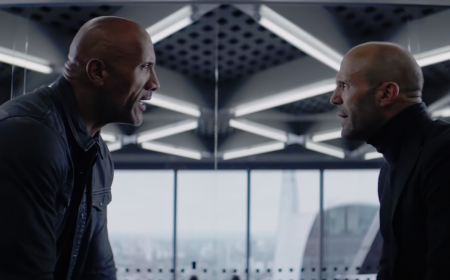 Ever since Hobbs (Johnson), an agent of the US Diplomatic Security Service, and Shaw (Statham), a former MI6 operative, first faced off in 2015’s Furious 7, the duo have swapped smack talk and body blows as they’ve tried to take each other down. But when cyber-genetically enhanced anarchist Brixton (Idris Elba) gains control of a bio-threat that could alter humanity forever — and bests a rogue MI6 agent (The Crown’s Vanessa Kirby), who just happens to be Shaw’s sister — these two sworn enemies have to partner up to bring down the only guy who might be worse than themselves. Directed by David Leitch (Deadpool 2) from a script by longtime Fast & Furious narrative architect Chris Morgan, the film is produced by Morgan, Johnson, Statham and Hiram Garcia. « American Comic Book Chronicles: The 1990s: 1990-1999 by Jason Stacks and Keith Dallas (book review).